Now available for immediate occupancy! Move-In Ready Condition. Spectacular long lake view!! Stop looking! Here is the rarely available 3 bedroom 2 bath, top floor condo in the newest Magnolia Falls subdivision of Falling Waters. 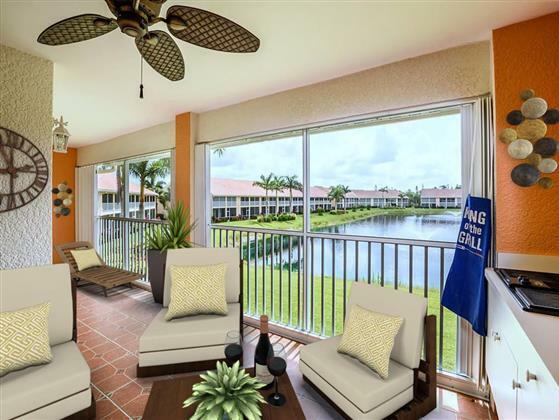 This spacious END UNIT has vaulted ceilings, spectacular long lake view, oversized lanai with the built-in kitchen and accordion shutters. Freshly painted interior and tastefully upgraded tile on the diagonal in the main living areas and front guest bedroom, new carpet in master bedroom and 3rd guest bedroom.NEW refrigerator and microwave. Unit comes with the spacious one-car detached garage. Falling Waters is ideally located within minutes of the Gulf of Mexico Beaches, famous 5th Avenue and 3rd Street Shopping, Dining, Boating Charters, and entertainment district.Resort Living in a Gated Community!